J.A. 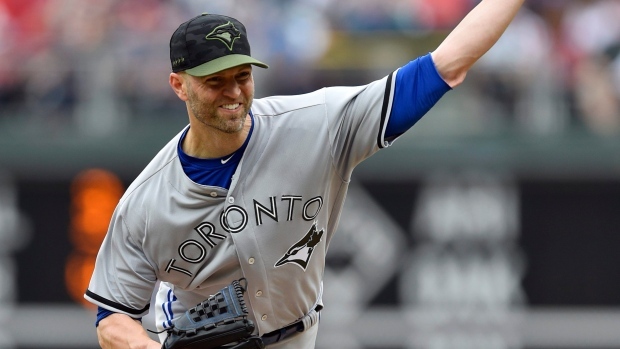 Happ continued his strong run of form with another great start, B.C. native Nick Pivetta's star is rising Ryan Tepera getting in the grove of closing out games. TSN Baseball Reporter Scott Mitchell provides his key takeaways from the game. J.A. Happ pitching well is never a bad thing. Whether it’s helping the Jays claw back to .500 or increasing his trade value as a pending free agent, there’s zero downside to potentially one of July 31’s biggest chips putting up numbers that suitors will take notice of. That’s exactly what Happ did Sunday, allowing only two earned runs over six innings, scattering six hits and punching out eight. Happ threw 100 pitches, 63 of them for strikes, and allowed just one extra-base hit. In case you’re counting, that’s three straight solid starts for the Jays to begin this nine-game road trip, with Happ building on the performances of Sam Gaviglio and Jaime Garcia. Happ, who lowered his ERA from 3.97 to 3.84, will take the ball again Saturday in Detroit. The final line isn’t going to wow anyone, but Victoria, B.C.’s Nick Pivetta showed why he’s another rising Canadian star, striking out seven over five innings. Pivetta got 13 swinging strikes on just 86 pitches, allowing four hits and a pair of earned runs before Phillies manager Gabe Kapler decided to pinch hit for Pivetta and turn things over to his bullpen. With a 97-mph fastball and a developing secondary arsenal that includes a slider, curve and change, the 25-year-old fourth-round pick of the Washington Nationals — he was traded to Philly for Jonathan Papelbon at the 2015 trade deadline, evidence you can get valuable pieces for aging commodities in July — is in the midst of a breakout season that’s soon going to garner him a whole lot more attention than he’s getting now. Pivetta is one of the big reasons the Phillies are ahead of schedule when it comes to their rebuild. Since going hitless in his return from Triple-A Buffalo last Tuesday, second baseman Devon Travis now has hits in three straight starts, and Sunday was his best game yet. Travis popped a double off Pivetta in the second inning to score Russell Martin and Dwight Smith Jr., giving the Jays a much-needed early lead. Travis added a single in the fifth to finish the day 2-for-3 with an intentional walk mixed in. If the Jays are going to hang around the wild-card race long enough to forego selling at the trade deadline, they’re going to need some players to step up out of nowhere, and Travis may be a good place to look for one of those performances. With the way things have been going for the bullpen lately, the Jays will take all the insurance runs they can get. As Ryan Tepera warmed in advance of locking down his second consecutive save, Curtis Granderson gave him some wiggle room with a solo home run in the top of the ninth. Not only did that give Tepera a two-run lead to protect, it was Granderson’s first home run since April 24. It hasn’t been pretty for the 37-year-old veteran since he hit his last homer, as he’s slashed just .153/.342/.237 in 76 plate appearances. Granderson came into the game with a .387 on-base percentage as the leadoff hitter, and he added to that with a 2-for-5 day at the plate. Tyler Clippard’s struggles have opened the door for Tepera in the ninth inning, and he answered the call with a pair of saves in the series win over the Phillies. After a nail-biter on Friday in which he allowed a pair of hits and a pair of walks but still escaped with the save, Tepera was less of a roller-coaster Sunday. He did walk the leadoff man, but then got an easy force out and a double play to end it. Tepera’s ability to get out both righties and lefties should serve him well in the ninth inning and it wouldn’t be a surprise to see him run with the job if given the opportunity, which seems to be what’s happening. UP NEXT: RHP Aaron Sanchez (2-4, 4.07) vs. LHP David Price (4-4, 4.08) on Monday, 1:05 p.m.